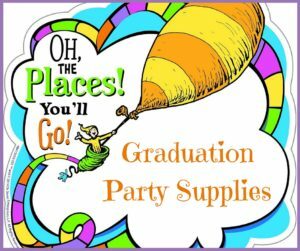 Graduation is a special time for high school and college students and their families. It’s a time to reflect upon the young person’s accomplishments and achievements in their educational endeavors and to give them the honor and recognition they deserve. 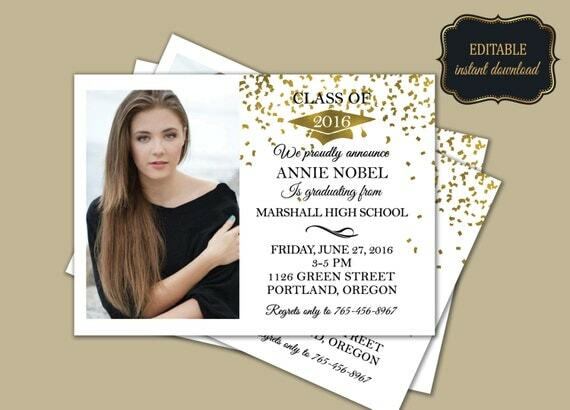 Choosing the right graduation announcement can provide a cherished keepsake for friends and family for years to come, as well as providing the information needed for attending guests. 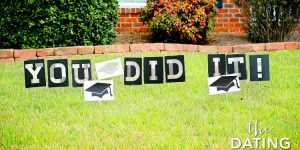 Printable graduation announcements allow for the personalization of the card, as well as the option to have the announcements printed elsewhere or to print them from home at your convenience. 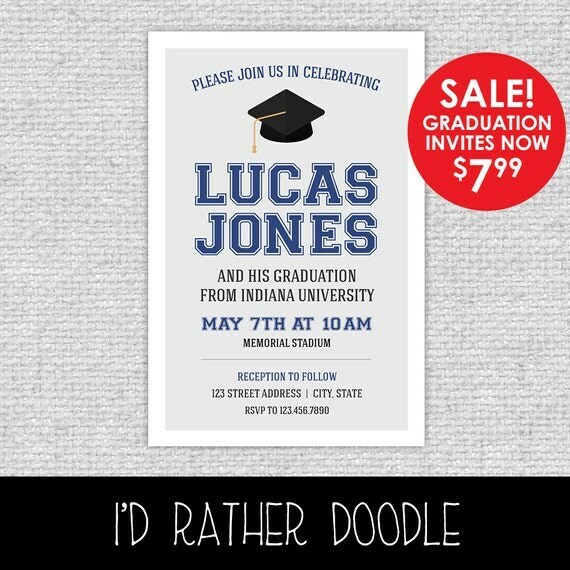 Here we look at some terrific printable graduation announcement from Etsy sellers, suitable for either high school or college graduations. 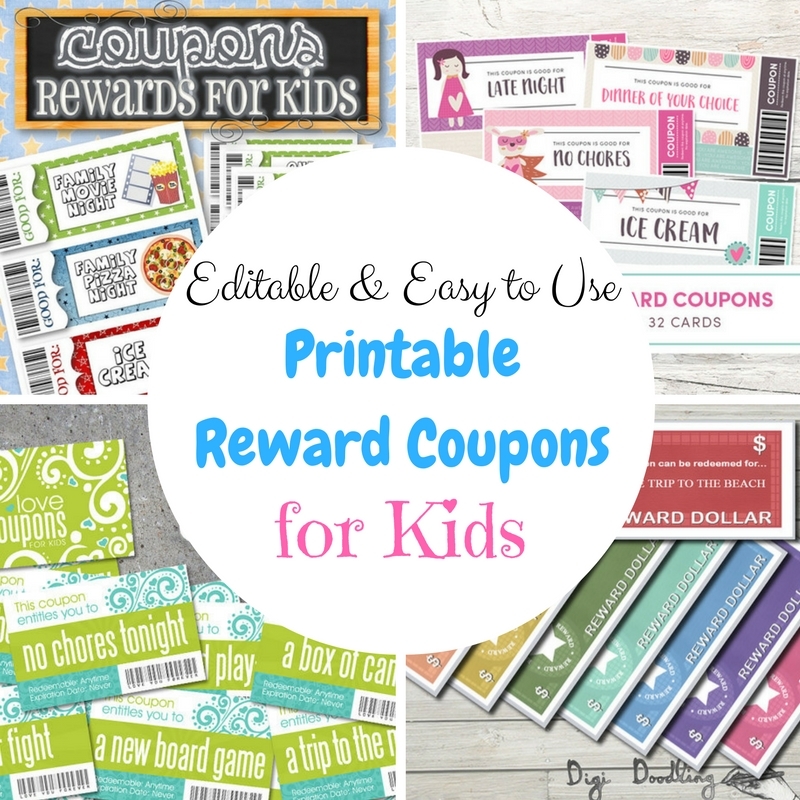 Printable announcements are also a great way to save some money as opposed to the cost of printed designs. 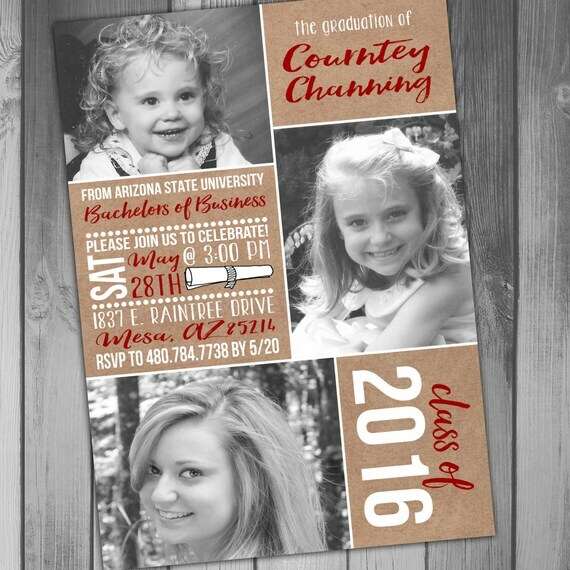 This handmade graduation announcement allows the customer to use up to three photos of the graduate for a collage effect. Announcements can be purchased as a digital file to print on your own, or you can order printed versions of the cards. Print packages are available and include overnight shipping. For digital files, proofs are available in 24 hours. Design features three photos of the graduate, with the Class of 2016 and the name of the graduate in bold letters, with additional information under the name. 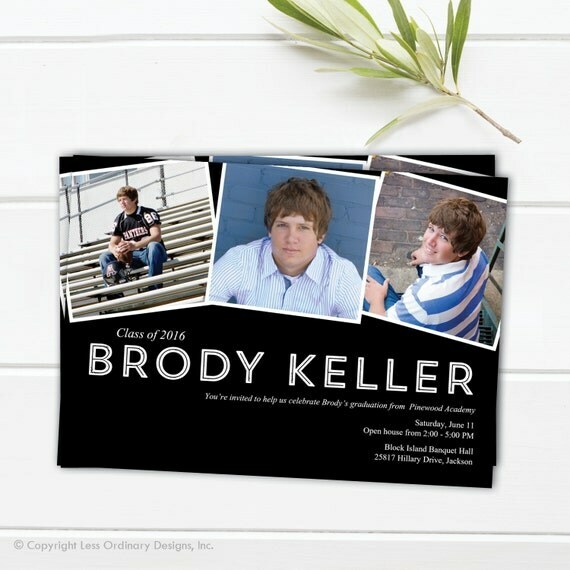 Available in your choice of two sizes, this printable graduation announcement has a photo on one half and the graduation information on the other half. Half with information looks like a chalkboard background. Include your personalized information and send the photo you would like to include to the Etsy shop owner through an Etsy message. 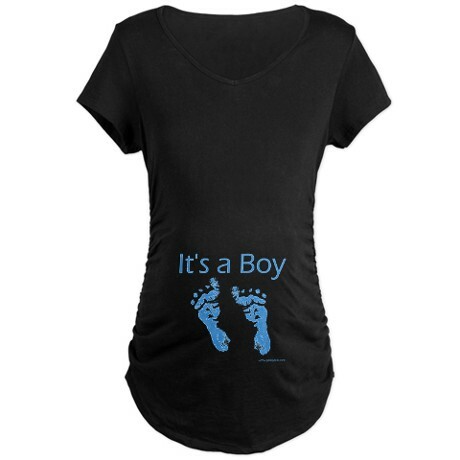 Files are sent to your email address 24 to 48 hours after the order is processed. 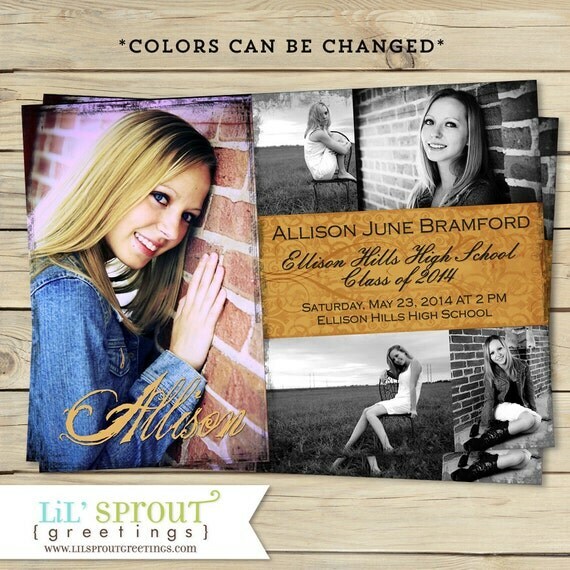 These printable graduation announcements can be printed by you or sent to your invited guests through email. Customers will receive an 8.5 inch PDF file with two invitations on it, as well as JPEG format upon request. 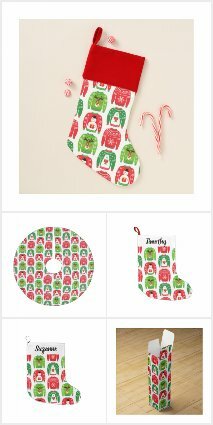 A coordinating printable 8.5 inch by 11 inch sheet that can serve as an envelope liner is also included. 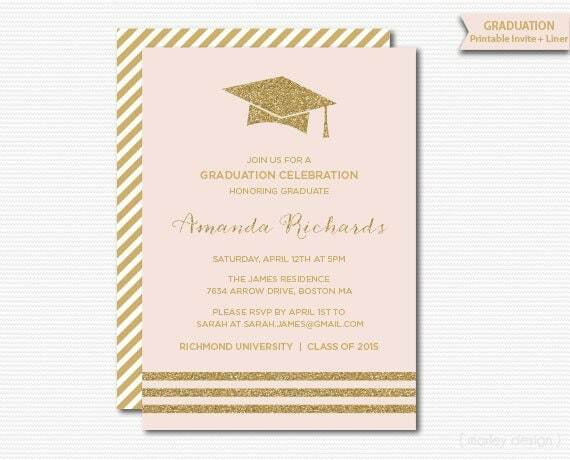 Design features a gold graduation cap near the top and three glittery looking stripes near the bottom of the card. 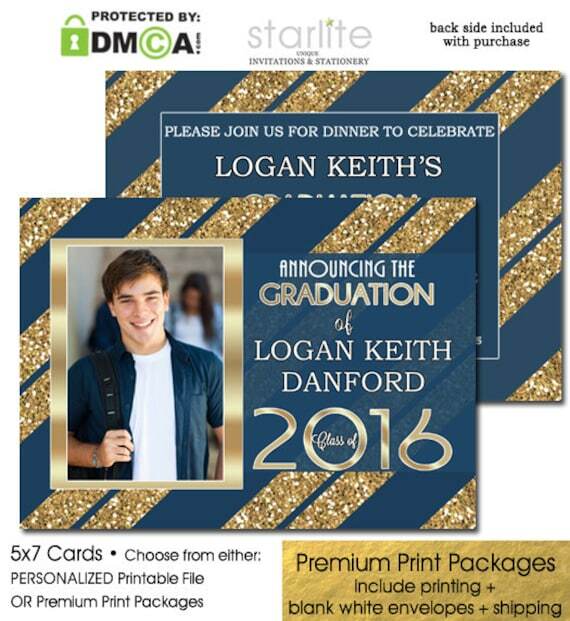 Choose from a printable PDF or JPG digital file for these printable graduation announcements. Design features three square photos of the graduate across the top of the card, with a yellow banner in the middle featuring the name and Class of 2016. Below the yellow banner is another photo to the left with the event information to the right of the photo. Yellow banner can be customized with school colors. 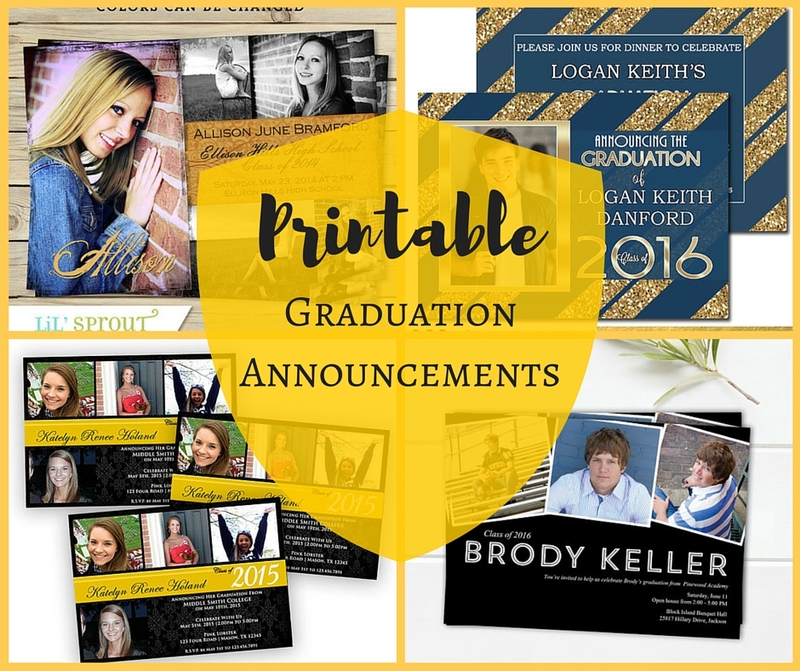 These printable graduation announcements feature five photos of your graduate, with their name at the bottom of the largest photo. A rectangular box placed between the other four photos has the name and graduation ceremony information. Colors can be customized. You will be sent a JPEG printable file format, or a PDF upon request. 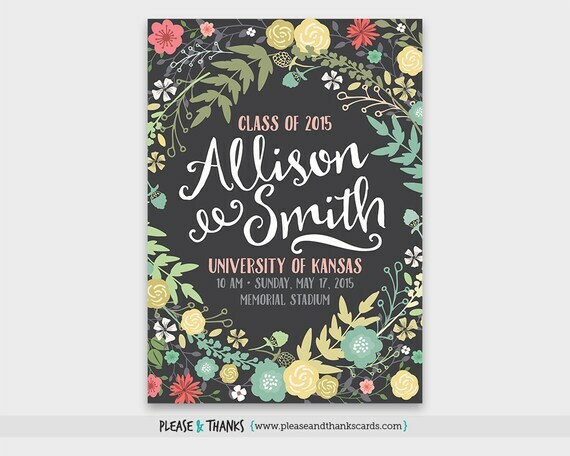 This graduation announcement has a black background and flowers and greenery surrounding the center. In the center, the graduate’s name and information is listed. This announcement does not have a photo of the graduate. Include your information in the “Notes to seller” section, and receive a proof within 2 to 3 days. Customers will receive one high resolution JPG file ready to print, and one high resolution PDF file. This is a printable announcement that features three photos of the graduate and three boxes of information. One box says ‘the graduation of (name)”, the other gives all relevant information, and the third box has the year. Photos may be done in color or black and white. Colors can also be customized. Customers will receive a high resolution 300 dpi JPG or PDF file. 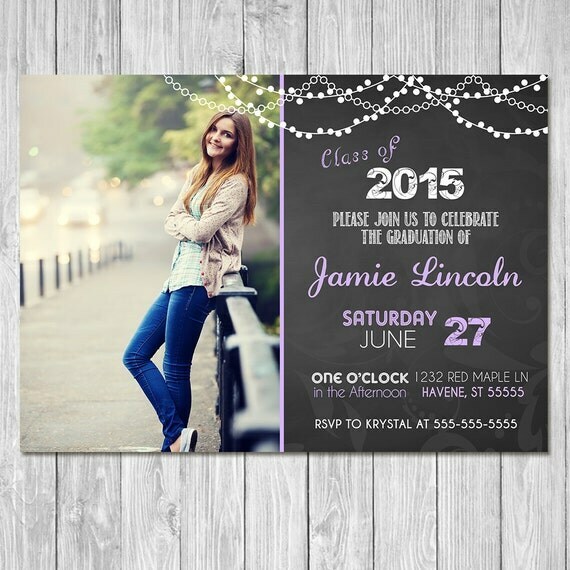 This seller also offers the option of printing the invitations as well. 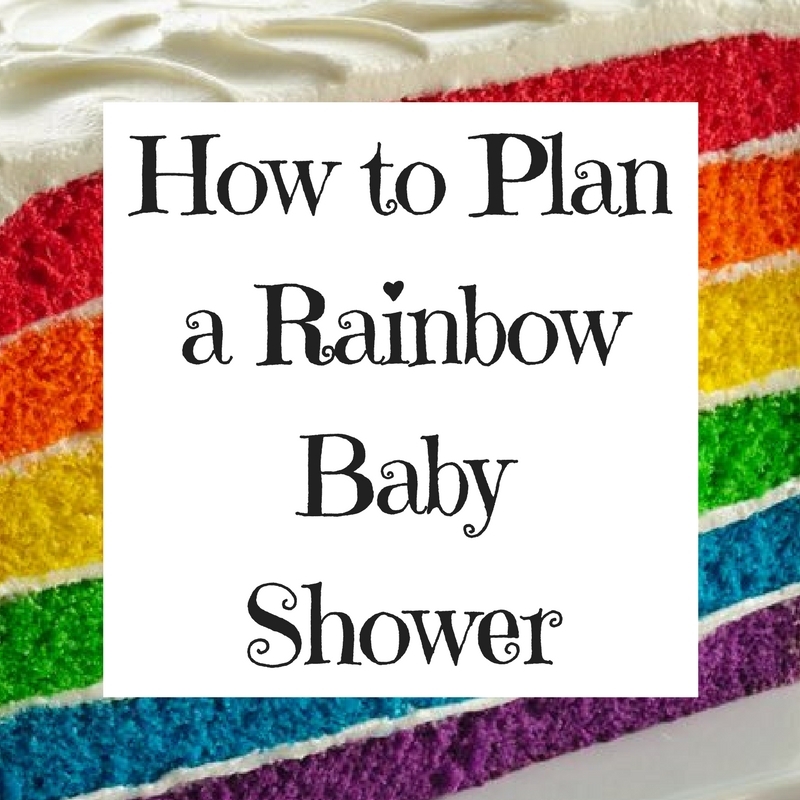 The colors and information on this printable announcement can be customized. Design features a graduation cap and the grad’s name and information. No photo is included. Proofs are received within 48 hours. Upon final approval, high resolution files will be sent to your email address. 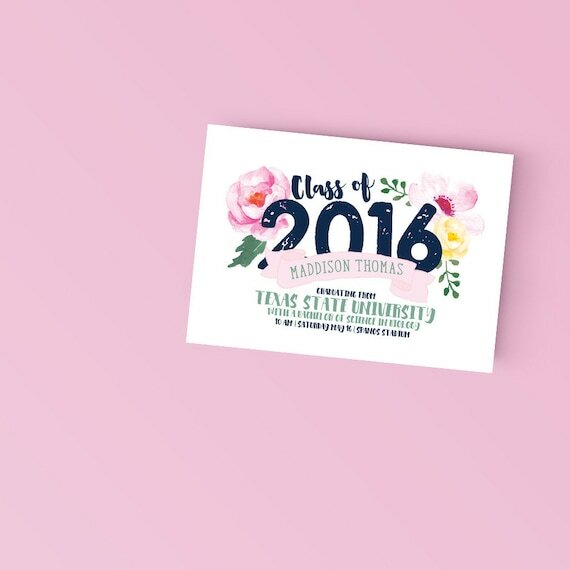 This card design features the words “The Class of 2016” surrounded by flowers, with a banner with the graduate’s name under it. Other relevant information is printed under the banner. 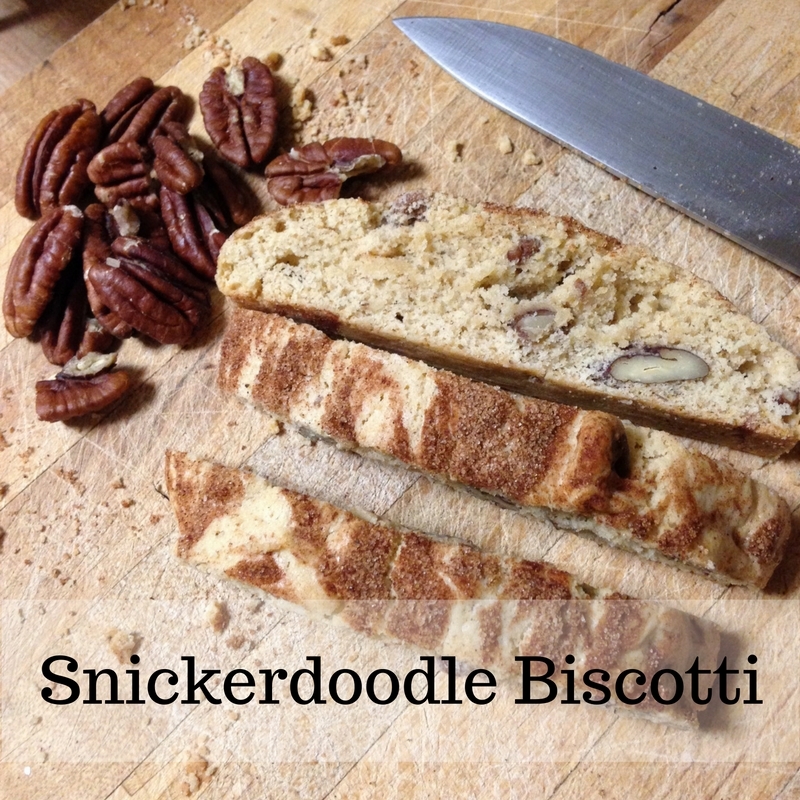 Let the seller know of any special requests through the “notes to seller” feature. Customers will receive their final PDF file through Etsy. 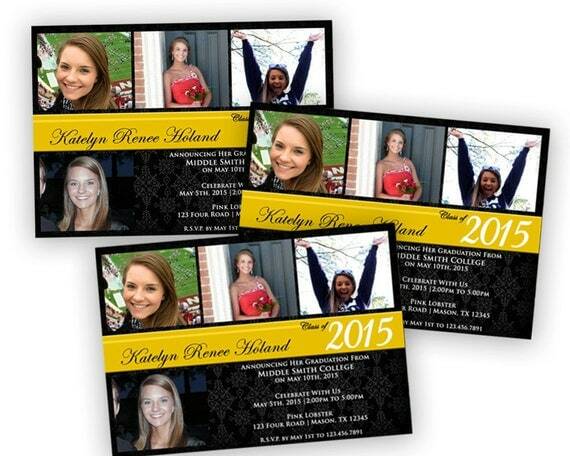 Don’t have time to wait for proofs and edits to your printable graduation announcements and cards? Then this instant download if perfect for you! 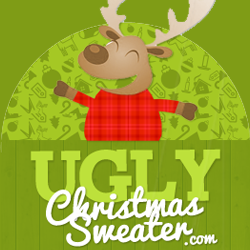 You will receive a template PSD Photoshop file where you can edit color, text, and more. 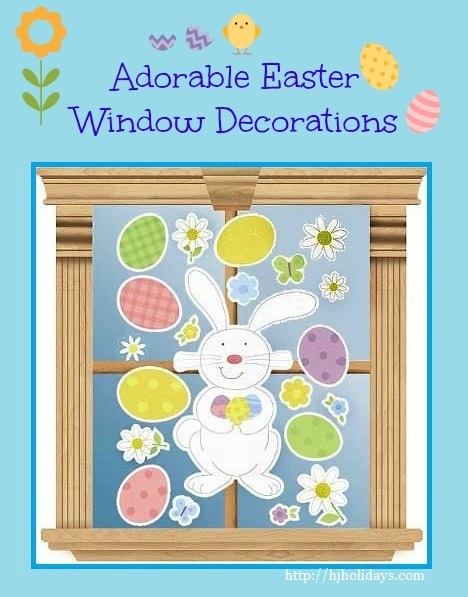 Instant download includes 0.125 inch bleeds, standard fonts, and a PDF instruction guide with step by step instructions. 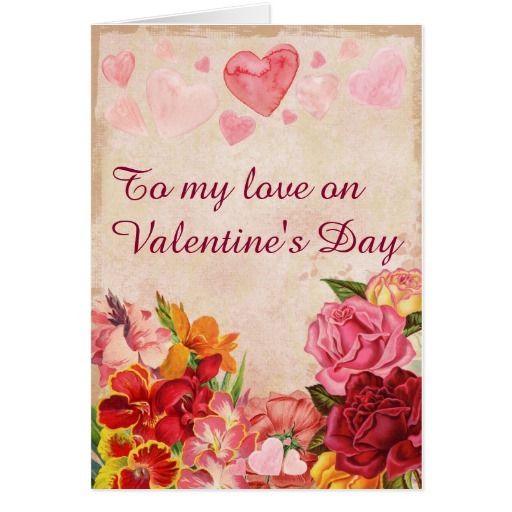 Easy to add your own images to the card. Design has one half of the card featuring a photo of the graduate and the other half with the name and information along with a gold graduation cap with 2016 printed on it. 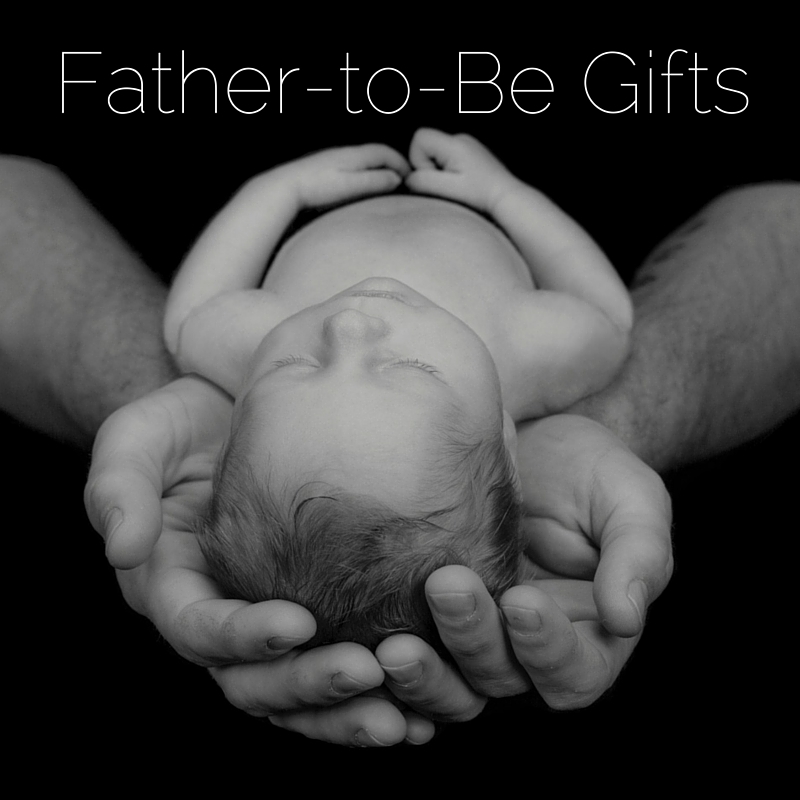 This printable invitation is not sold as a template but will be sent as a personalized printable JPG and PDF file. 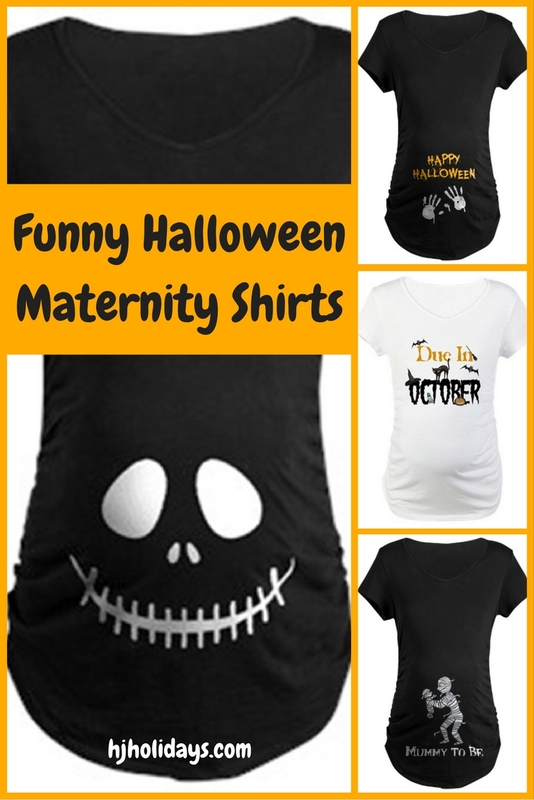 This design also has the option of ordering printed packages from the Etsy seller. 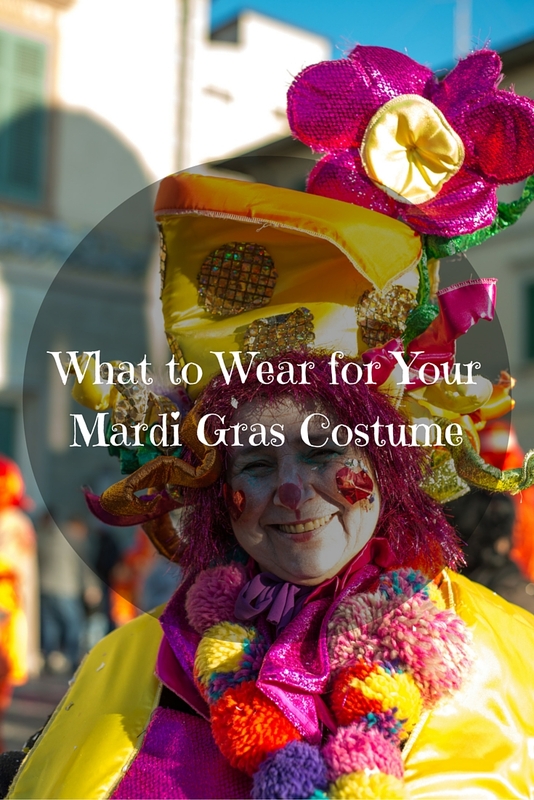 Design features a blue background with stripes that look like gold, glittery foil. A photo of the graduate appears on the left hand side, and on the right side the name of the graduate, Class of 2016, etc. A proof will be sent to the customer through email by the posted turnaround time. Order includes printing instructions.